Easter wouldn’t be Easter without baskets brimming with chocolates and candies. 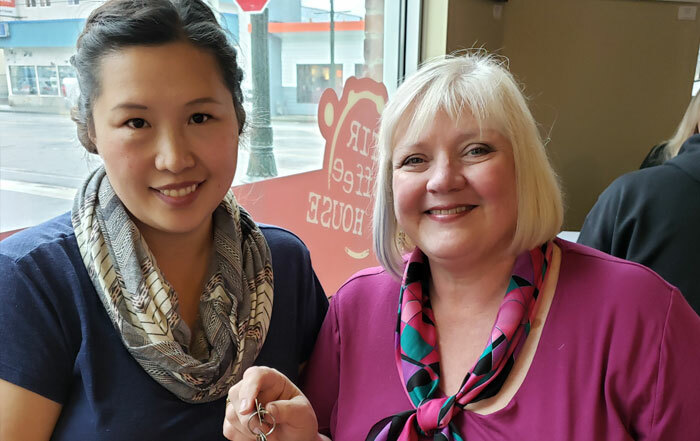 The spring holiday tradition of sharing sweet delights is one we have loved in our neighbourhood for as far back as the early 1900s. 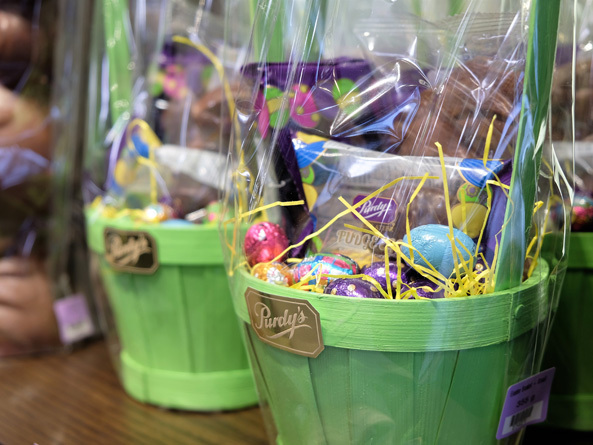 Today, when the Easter Bunny needs help finding special goodies to fill baskets, he hops on over to South Granville – specifically to visit Purdys Chocolatier and Meinhardt Fine Foods! 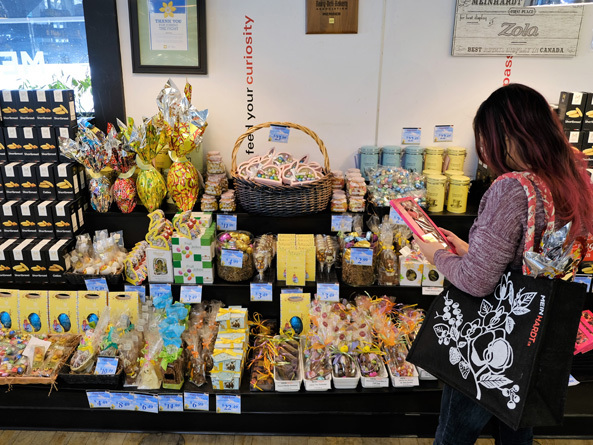 These shops are ready to help complete Easter with edible bunnies and bon bons…for everybunny – kids and adults who are kids at heart. Get ready to adorn those baskets and holiday tables with the cutest, sweetest, and tastiest treats in all shapes, sizes, and colours! 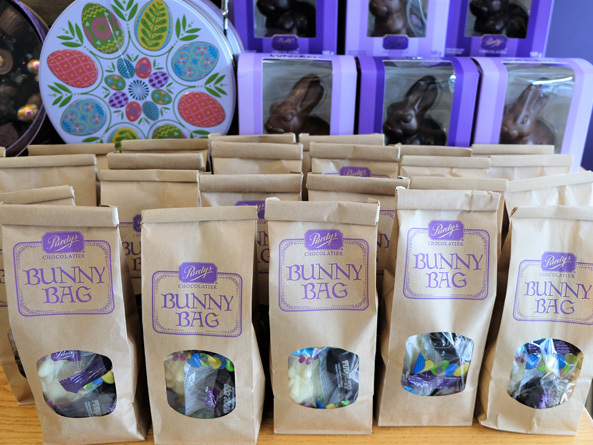 There are chocolates aplenty at Purdys to assemble any gift combination as well as ready-to-give bunny bags and baskets. Kiddies will especially adore the personalized Create Your Own section. 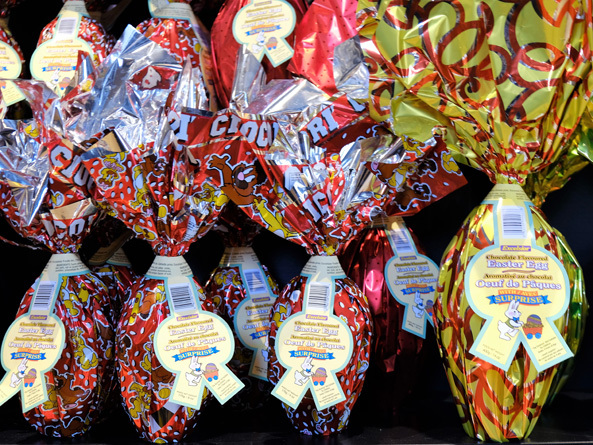 And, Meinhardt Find Foods’ assortment of Easter items is astounding, including all-time favourites – from marzipan, fruit jellies and sherbet straws to eggs-within-eggs and Daniel chocolates; also, freshly made gourmet options like macarons – just to name a few. 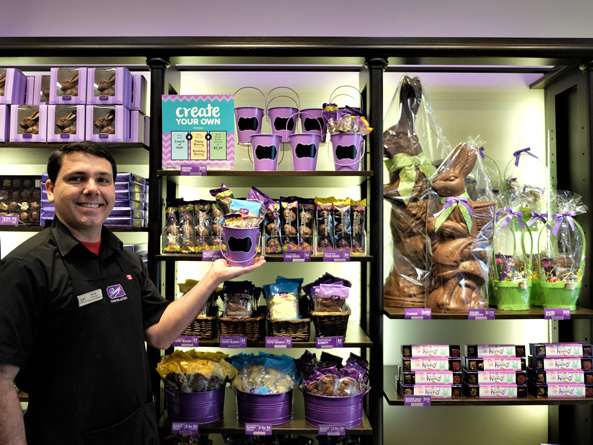 In the sweet spirit of Easter, we asked Angela Bains (Store Manager, Purdys Chocolatier) and Michael Meinhardt (General Manager, Meinhardt Fine Foods) to tell us more about Easter at their stores. 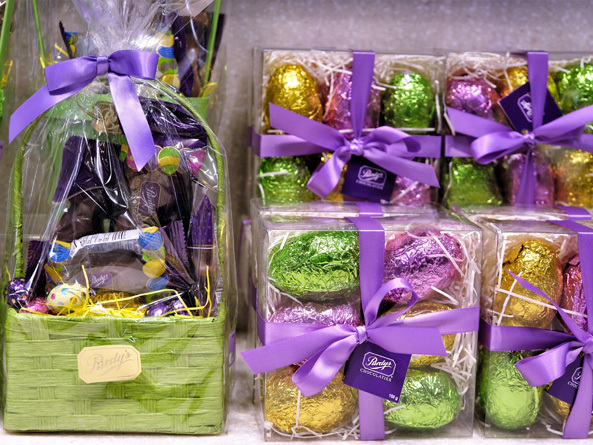 “We celebrate every holiday at Purdys: Christmas, Eid, Hanukah, Nowruz, Vaisakhi and many others, but Easter is very special to us. A lot of our customers at South Granville grew up with us and came in every Easter for their chocolate bunnies or eggs. 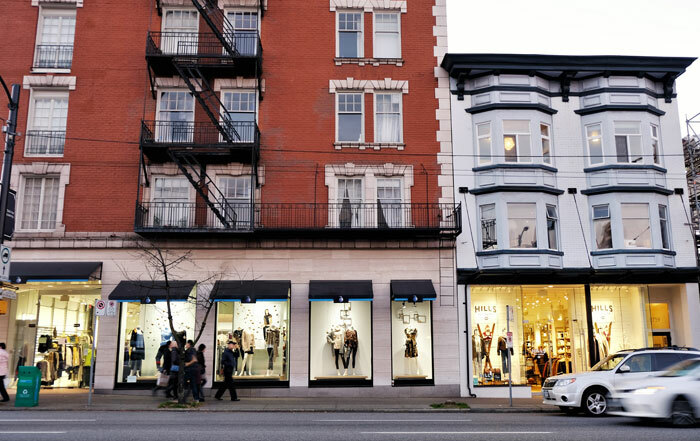 In fact, our second ever shop that we opened was on Granville Street, sometime in 1909, and it was just steps away from our current location. 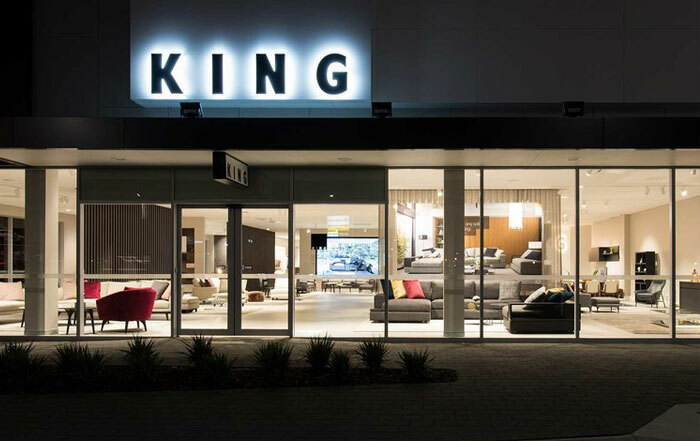 It closed down in 1976 but we still get customers coming in for their favourite chocolates and sharing memories of the old shop or the times when they’d line up at Easter for our special once-a-year tour of our Factory Kitchen on Kingsway. 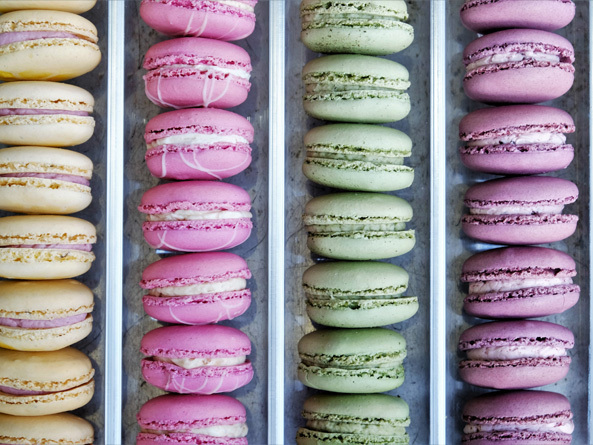 “Here at Meinhardt Fine Foods we celebrate this springtime holiday with handcrafted desserts galore. 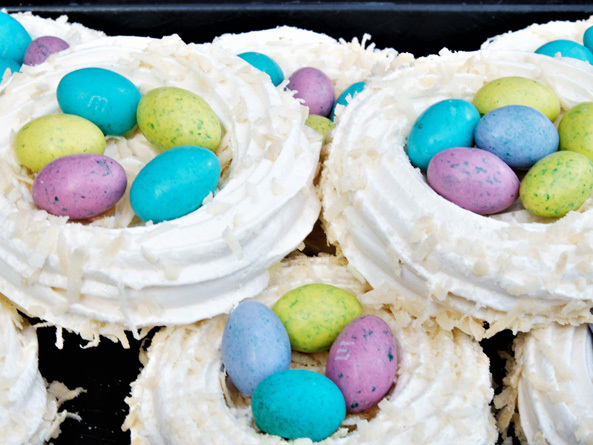 Our gourmet meringue nests and Easter cookies are all made by hand with fresh natural ingredients. macarons, and sugar cookies to add to the spirit! 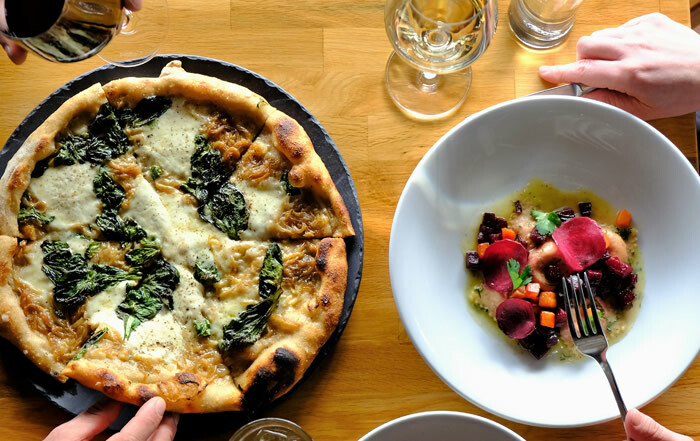 For more options to complete your Easter baskets and tables, visit Williams-Sonoma for an array of edible goods, Hill’s Dry Goods for their Sugarfina selection, Trees Organic Coffee for their Almond Marzipan Cheesecake, and Pottery Barn Kids for the most adorable plush bunny rabbit collection. Have an Eggcellent and Hoppy Easter!